Steve seemed like he could use some time away so I invited him to join me for a couple of days in Tahoe to do some hiking. The hikes were moderate but Steve would find them challenging because, well, we're getting older and he hasn't done any long hikes in a while. One of the reasons he agreed to do this was to see if he still could - we like little reassurances as we age that the downhill slide isn't too steep. We drove from San Jose around 7a against the rush hour traffic out of town, getting across the Central Valley and through Gold Country to get us to Echo Lake in about three and a half hours. It would take another half hour before we were ready to head out. The goal today was a hike along the PCT to Lake Aloha in the Desolation Wilderness with climbs of four minor summits along the way. I figured we'd first hike the six miles to the lake before letting Steve decide which peaks he'd have the energy for as we made our way back. I wasn't sure we'd get back before sunset so I carried a pair of working headlamps as insurance. Temperatures were on the chilly side, in the low 50s, trending downward to the high 20s overnight. Skies were clear as we drove up US50 and the west side of the Sierra, but smoke from the Table Fire about 20mi to the west would drift in to obscure views during most of the hike today. The lodge and harbor rentals were closed for the season, but they were still running a boat taxi across Echo Lake. We chose to hike the extra 3mi around the lake since our hike wasn't going to be that hard. I was surprised by the amount of folks, both dayhikers and backpackers that we shared the trail with on a Friday in mid-October. They say this is the most used Wilderness area in the country on a per area basis and I have no reason to doubt it. I do find it somewhat ironic given the name Desolation Wilderness. The hike is mostly flat for the first three miles as it loosely follows the north side of the lake past a few dozen summer cabins that dot the shoreline. 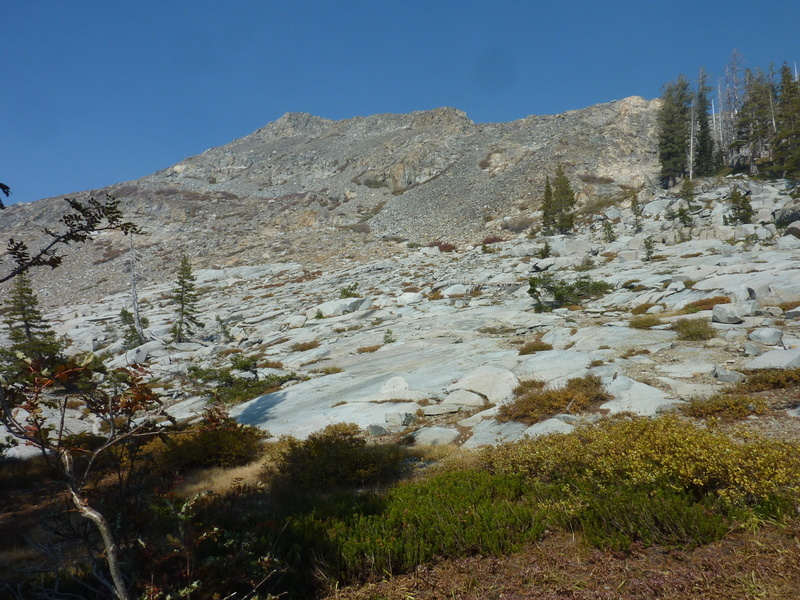 The PCT then begins a modest climb of about 800ft as it enters the Wilderness and rises to a local highpoint at Haypress Meadow before dropping a short distance to Lake Aloha. There are various well-marked trails branching off, heading to various destinations such as Triangle Lake, Tamarack Lake, Lake of the Woods and Lake Lucille. It took us about two and a quarter hours to reach Lake Aloha where we found conditions the smokiest. Pyramid Peak and the Crystal Range across the lake could not be seen in any great detail though only two miles distance. We took a break here to snack and discuss strategy, specifically whether Steve wanted to join me for the climb up to Cracked Crag only half a mile behind us to the north. I guessed it would take me an hour and a half for the roundtrip effort to which Steve added an extra hour for his slower pace to come up with a return to Lake Aloha after 4p. That seemed too much and Steve elected to wait this one out, knowing there were other summits he could join me for. We agreed to meet back at the Tamarack Lake junction which would give him a few hours to enjoy the lake and hike some on his own. Though the name is somewhat impressive, the climb to Cracked Crag is nothing special. It looks from below to be a tedious talus slog, but it comes off somewhat better than that with some slabs and more solid terrain to make it a decent scramble, all class 2. I was fooled by the haze which had made the summit appear to be further and higher than it really was and it ended up taking only 20min to climb to the summit where a garishly oversized cairn marks the highpoint. At 8,700ft+ it would normally have some pretty good views, particularly of that overlooking Lake Aloha, but alas the haze conspired against it. With more time than I had expected to have at this point, I decided to head southeast along the ridgeline to Keiths Dome, a mile and a half in that direction. This turned out to be a rather pleasant cross-country jaunt, passing by the unexpected lakes that are found in the saddles, including the beautiful Jabu Lake, small but perched over a 1,000-foot drop to the north. I crossed over a few of the side trails branching off the PCT around Lake Lucille and Lake Margery before scrambling more class 2 to Keiths Dome. It turns out to be broad and flattish and not nearly the scenic perch found on Cracked Crag. I descended the SE side of Keiths Dome to reach the PCT about a quarter mile west of the Tamarack Lake trail junction and easily reached the spot with about 5min to spare before our 3:45p meeting time. After about 15 minutes' time I began to wonder what became of Steve - it was unlike him to be late for such things. He mentioned he might go check out Tamarack Lake and my first thought was maybe he fell asleep on a warm rock by the water's edge, so I went down to check out the possibility. I shouted out his name a few times when I got there, but got only silence in return. Back I went to the junction. It was about 4:10p by the time he came rambling down the trail. Seems the fault was mostly my own because I had guessed the junction to be about 45min from Lake Aloha and Steve had used that estimate to judge when to leave the lake where he'd spent most of the time he had. It was actually about half an hour longer than that. In the time I had sat there to ponder the various possibilities (getting lost or missing the junction seemed high on the list as well), that one had never occurred to me. Steve had some regrets on choosing not to join me for Cracked Crag, but we made up for this some by stopping for the other two summits on our way back along Echo Lakes. Red Hill is a very easy little bump on the isthmus between the two lakes, above some of the cabins overlooking the lakes. The diversion from the trail wasn't even five minutes, going up one side and then down the other to regain the trail. Dumbo is an unofficially named point overlooking the spillway and less than half a mile from the TH and makes for a more interesting scramble than Red Hill. It features a class 3 summit block and has nice views overlooking Lake Valley to the east where US50 drops into the Tahoe basin. We continued scrambling off the summit along the ridgeline to the southeast, finding a use trail weaving through brush and rock to return us to the PCT near the TH. We were back across the spillway to the harbor and parking lot at 6p, the sun having settled behind Ralton Peak and the temperatures dropping quickly - a good time to end the hike.